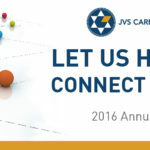 JVS Career Services will celebrate a year of milestone achievements and look forward to future successes at their annual meeting at 7 p.m., on May 31, 2016, at Rockdale Temple. In 2015, clients of JVS Career Services started 228 new jobs, with a combined annualized economic impact of $11.7 million. To RSVP for the JVS Career Services Annual Meeting, click here.